Visiting the High Line, which is in Manhattan’s West Side area was a real treat (especially after reading the National Geographic article Miracle Above Manhattan in the March 2011 issue). This beautifully, well designed park brings serenity even to the busiest, fast-moving city dweller. People were having lunch, talking to friends, or pulling out cameras to capture a photo (an infinite amount of possibilities). One can easily spend a day and evening roaming around the High Line alone. It also reminded me of why people flock to New York. The overall design of the High Line is elegant yet captures the city’s personality in such a way where you know the High Line could only exist in Manhattan. 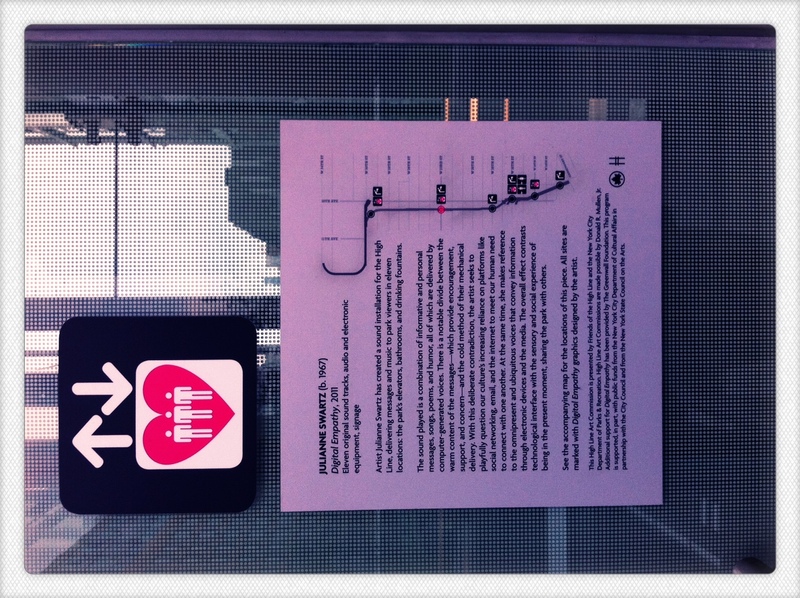 With a visit to the High Line so early in the trip, it was a thrill that the first physical cue that indicated I was in a completely different environment was installation art by Julianne Swartz. Entering the High Line in the middle, one must take an elevator to the park. 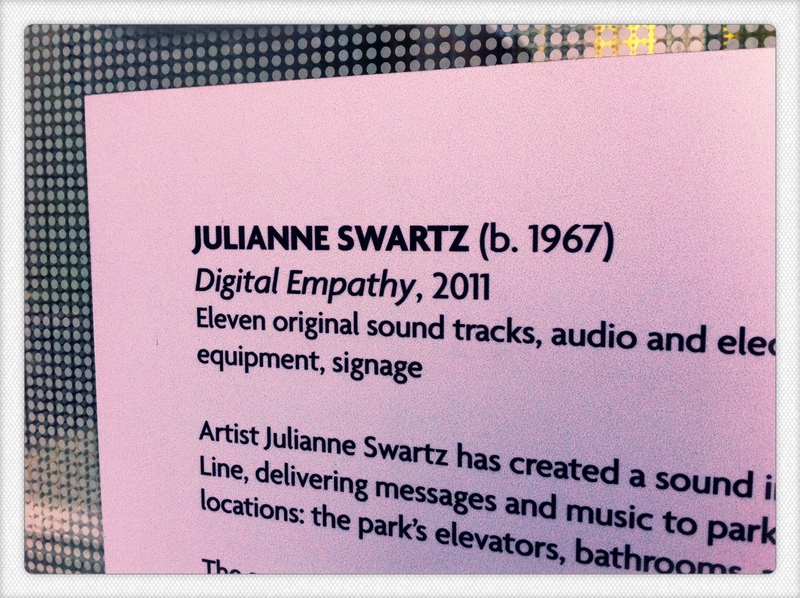 Currently, Swartz’s work, Digital Empathy, is a sound piece that involves poems, personal letters, and song lyrics recited by computer-generated voices. At first, walking in the elevator, you hear these intimate messages but the monotone and seemingly cold voice with no inflection makes the message sound eerie and unsettling. After reading the work’s description, I felt compelled to go up and down the High Line looking for the signage to hear a voice and listen. Digital Empathy is a sobering reminder that communication delivered in an unfamiliar way makes us listen carefully and fastidiously. Yet, isn’t that strange, that something unemotional stops and makes our ears and the rest of our senses vigilant? Are the sounds of our own voices not enough? Swartz certainly made me wonder. Here’s hoping she showcases work in San Francisco. I would definitely see one of her shows and love to talk to her. Julianne Swartz, if you’re reading this, thanks for reminding me to stop, listen, be curious, and stay human. Posted in Art and Technology, Conceptual, Creative Coding | Programming, Digital Art, Social Networking and tagged as bard, digital empathy, environment, friends of the high line, high line, julianne swartz, New York, postaday2011, social networking.